You know what you want in a wedding invitation; you just need the means to make it happen. Invitations by Dawn allows you to upload your own design and have it professionally printed on our beautiful papers. Taking the time to design something yourself or having a friend design something for you is truly special, and you want to make sure the finished product looks 100%. 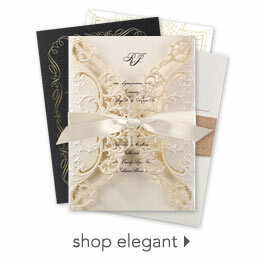 Choosing a wedding invitation printer like Invitations by Dawn makes all the difference in the world! You even get your choice of five different types of paper, which means you can choose the paper that best compliments the design created for your DIY wedding invitations. What format do you need my file in? Accepted file types include BMP, GIF, JPG, JPEG, PCT, PICT, TIF and TIFF. A resolution of 300 dpi or higher is required for successful upload. Do I get envelopes with my invitations? Yes, you get both inner and outer envelopes in your choice of white or ecru. Can you make adjustments to my artwork if I request it? We cannot make any adjustments to your artwork. You will want to make sure all text and artwork are final before uploading. What invitation sizes do you offer? We offer two invitation sizes: 5 1/2" x 5 1/2" and 5" x 7". What paper is used for these DIY wedding invitations? You get a choice! Choose from five different types of paper, each one possessing its own unique qualities. Visit our paper options page to see the types of paper we offer. Your order should be shipped and delivered within 5-7 business days.